As promised, the letter J has been bookended by a pair of Danish pop duos. There is no long-winded tale of discovery here. I was just one of the many people who succumbed to being bombarded by the power tracks from this highly contagious bundle of disco-targetted fluff. There is so much to love about this CD. The cover perfectly captures the content, which is all neon and bubbly, and inducing of much arm-waving and other silly gestures. Sitting around at home today reading through academic articles has not been the ideal setting for this collection of tracks. This is a Saturday night album (or whatever evening it is that the kids do their thang these days). It is helium-like in its upbeat-ness. The songs have that breathy, rushed jolliness that so few bands manage (think B-52s), over a great set of rhythms. The two lads obviously have very short attention spans, as they jump from one floor filler to another, chanting choruses that anyone/everyone will yell along to (while ignoring that glam poppers like Sherbet and Bay City Rollers were onto this schtick in the mid-70s). Somehow, the duo do find time within the 32-or-so minutes to manage to produce a hilarious Dylan meets Beach Boys meets Oasis hybrid on Shake Me Baby. Way back before Al Gore invented the internet and digital music, I owned two fantastic albums from the Jungle Brothers on a medium known as the cassette (a.k.a. tape). These were the first full-lengthers in the JBs’ long career – ‘Straight Out the Jungle’ and ‘Done By the Forces of Nature’. Both were an innovative mix of hip-hop and house music, coupled with a ‘black and proud’ Africanistic thing. They were a distinctive companion pieces to the works of De La Soul and A Tribe Called Quest. This here CD was released more than a decade later, and hits none of the cassettes’ heights. The JBs’ earlier experiments with the house and dance genres are expanded, as they hook up with a Propellerhead. This means loads more simplistic chanting than warranted, a higher level of repetition, and very little quality rhyming. This is the second album I have reviewed from South African stalwart Johnny Clegg. 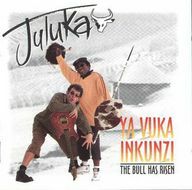 While Savuka were Clegg’s band through much of the late 80s and early 90s, this 1997 release saw him reform an old act one last time. Being super hip and groovy, we own the South African CD with the Zulu name, rather than rest-of-world version called ‘Crocodile Love’. I find this incarnation of Clegg much more exciting and innovative than in his Savuka guise. The music is much more danceable and less overtly poppy and disposable. I find it more listenable on the tracks where he and Sipho Mchunu sing in Zulu than the English language material. The latter are a little too ambitiously poetic for my liking, especially as said poetry tends to be very tie-dyed (think Grateful Dead meets Lion King vibe). This pushes Clegg dangerously close to Sting territory. This CD would work as a nice companion piece to Paul Simon’s ‘Graceland’ album, especially Journey’s End which features a startlingly similar accordian opening.